Is it Safe to Ride a Stationary Bike When Pregnant? Exercising during pregnancy offers many benefits when it is done safely. Riding a stationary bike is one option, but it is important to talk to your doctor before beginning any exercise program during pregnancy. The safety of any type of exercise depends on your own medical situation. The American Pregnancy Association states that riding a stationary bike is safe during pregnancy. The bike can help to support your weight. And although your changing center of gravity makes you more likely to fall on a regular bicycle, a stationary bike reduces that chance. Exercising during pregnancy can increase your energy levels and reduce back pain. It can also improve your sleep habits. According to the University of Maryland Medical Center, exercise during pregnancy can improve your ability to cope with labor. When choosing a stationary bike to use during pregnancy, look for one that has a comfortable seat. If you are experiencing back pain, a recumbent bike with a cushioned back and pedals in the front may be easier. 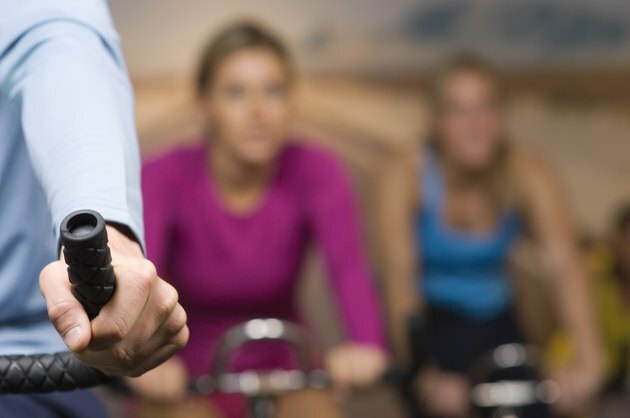 Look for a bike that comes with a heart rate monitor or use your own during exercise. Keep in mind that a stationary bike will work out your lower body only. Babycenter suggests that you look for a model with dual action arms so you can also work out your upper body. Stretch before you start exercising to help prevent injury and strain on your muscles. Avoid wearing tight clothes during exercise and remember to breathe deeply. Drink water regularly before, during and after your exercise to avoid dehydration. Turn on a fan and face it toward you or choose a bike that is near the fan vent. Closely monitor your body signals and stop exercising before you become exhausted. Discontinue your workout and call your doctor if you experience any serious side effects while exercising during pregnancy, including vaginal bleeding, dizziness, shortness of breath, nausea and contractions. Your doctor may want to examine you and may restrict your activity level. Can Stretching While Pregnant Hurt the Baby?